Richard Webber Young was born in Yeovil on 3 March 1892, the son of glove finisher Albert Joseph Young (b1868) and Hope née Hillard (1861-1926). Albert and Hope had seven children; Mary Louisa, known as Louisa (1889-1959), Gertrude Dorothy, known as Dorothy (b1890), Richard, Emily (b1893), William Arthur, known as Arthur (1896-1959), Ernest (1898-1981) and Oliver (1898-1900). In the 1901 census the family were listed living at 2 Wellington Street, on the very corner of the junction with Huish. Albert was not present on census night and Hope was listed as the head of the family. Living with her were Louisa, Richard, Emily, Arthur and Ernest. Hope listed her occupation as a glove machinist. By the time of the 1911 census the family had moved to 3 Camborne Grove. Albert, Hope and all six children were listed; Albert gave his occupation as a glove finisher and Hope gave hers as a glove machinist. 19-year old Richard gave his occupation as a cabinet maker. He worked for Raymond Brothers in Manor Road. Richard enlisted at Yeovil, probably in early 1915. He initially was enlisted in the King's Own Yorkshire Light Infantry with the Service Number 23647 but was soon transferred to the 25th (Tyneside Irish) Battalion, Northumberland Fusiliers. His new Service Number was 41503. He landed in France on 27 July 1915 and was initially in action at the Somme on 1st July 1916. Richard fought in The Battle of Bazentin Ridge (14–17 July 1916) which was a part of the Battle of the Somme. The British Fourth Army made a dawn attack on 14 July, against the German 2nd Army in the Braune Stellung from Delville Wood westwards to Bazentin le Petit Wood. Dismissed beforehand by a French commander as "an attack organized for amateurs by amateurs", the attack succeeded. Almost immediately afterwards he took part in the Battle of Pozières Ridge (23 July - 3 September 1916). This battle represented an attempt to exert renewed pressure on the strategically important central uplands, notably around the vital positions of Thiepval and Pozières. The Battle of Flers–Courcelette was a battle, again within the Somme Offensive, launched on 15 September 1916 with the battle continuing for a week. Flers–Courcelette began with the objective of cutting a hole in the German line by using massed artillery and infantry attacks. This hole would then be exploited with the use of cavalry. It was the third and final general offensive mounted by the British Army during the Battle of the Somme. By its conclusion on 22 September, the strategic objective of a breakthrough had not been achieved; however tactical gains were made in the capture of the villages of Courcelette, Martinpuich and Flers. In some places, the front lines were advanced by over 2,500 yards (2,300 m) by the Allied attacks. The battle is significant for the first use of the tank in warfare. As part of the Arras Offensive the 25th Battalion took an active part in the First Battle of the Scarpe (9 to 14 April 1917). The Arras Offensive was a major British offensive during the First World War. From 9 April to 16 May 1917, troops from the four corners of the British Empire attacked trenches held by the army of Imperial Germany to the east of the French city of Arras. Zero-Hour for the First Battle of the Scarpe had originally been planned for the morning of 8 April (Easter Sunday) but it was postponed 24 hours at the request of the French, despite reasonably good weather in the assault sector. Zero-Day was rescheduled for 9 April with Zero-Hour at 05:30. The assault was preceded by a hurricane bombardment lasting five minutes, following a relatively quiet night. When the time came, it was snowing heavily; Allied troops advancing across no man's land were hindered by large drifts. It was still dark and visibility on the battlefield was very poor. A westerly wind was at the Allied soldiers' backs blowing "a squall of sleet and snow into the faces of the Germans". The combination of the unusual bombardment and poor visibility meant many German troops were caught unawares and taken prisoner, still half-dressed, clambering out of the deep dug-outs of the first two lines of trenches. Others were captured without their boots, trying to escape but stuck in the knee-deep mud of the communication trenches. 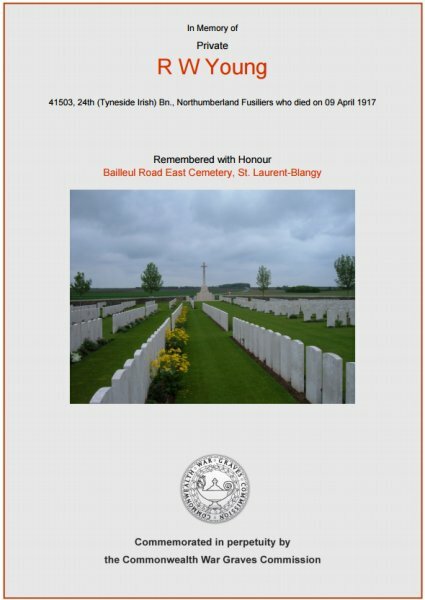 Richard Young was killed in action during this first day of the battle, 9 April 1917. He was 21 years old. The Western Gazette, in its edition of 11 May 1917 reported "Mrs Young, of Huish, Yeovil, has received intimation from the Infantry Record Office, York, that her son, Private RW Young, of the - Northumberland Fusiliers, was killed in action in France on April 9th. The deceased soldier, who enlisted soon after the outbreak of hostilities, had been in France for two years, and had seen considerable fighting, taking part in several big battles, including the Battle of the Somme, during which he received a wound in the arm. He was, prior to enlisting, employed by Messrs. Raymond Bros., cabinet makers, of Manor Road, where he had spent several years, and where he had been apprenticed. The deceased soldier was well known and highly respect in the town and district, and his many friends will regret to hear of his death. Much sympathy is felt for the parents (who have another son serving in the Navy, and another who has been discharged from the Army) in their sad loss." 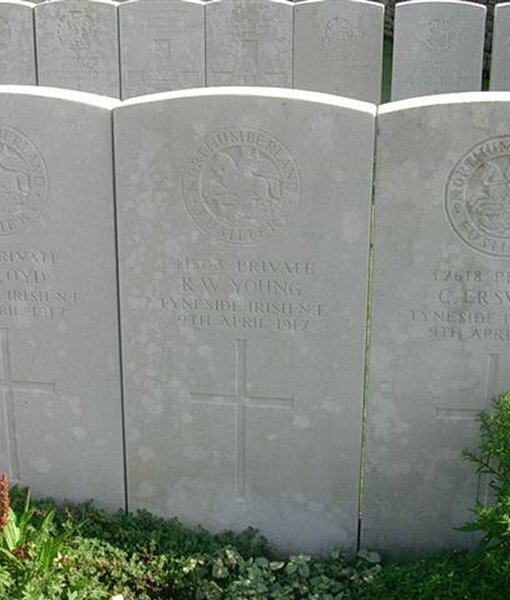 Richard Young was interred at Bailleul Road East Cemetery, St Laurent-Blagngy, Pas de Calais, France, Grave I.C.38. His name is recorded on the War Memorial in the Borough. The Commonwealth War Graves Commission certificate in memory of Richard Young. Richard Young's grave in Bailleul Road East Cemetery.